Be the first to share your favorite memory, photo or story of Lillie. This memorial page is dedicated for family, friends and future generations to celebrate the life of their loved one. 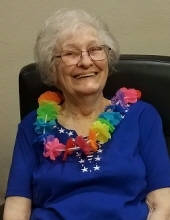 Weiner- Lillie Mae Greeno, 87, formerly of Fisher passed away Monday, February 4, 2019. She was born June 16, 1931, in Hickory Ridge to the late Vanro and Mary Wilbanks Jackson. She was homemaker and a member of the First Christian Church in Weiner. Lillie and Lindberg Greeno were married on December 15, 1947 and enjoyed forty-six years together until he passed in 1993. She was also preceded in death by her husband, Lindberg Greeno; two children, Cathy Greeno Peyton and Joe Greeno; two sisters, Louella Denome and Jane Griffith; a brother, Harel Clark; a great-grandson, Miles Lindberg Greeno. Left to cherish her memory are her children and their spouses, Lindy and Tim Jaggers of Mt. Pleasant, Texas and Troy and Greta Greeno of Fisher; a sister, Lois Bullington of Seven Points, Texas; seven grandchildren; fifteen great-grandchildren; two great-great-grandchildren and several nieces and nephews. Visitation will be from 10:00 am until time of service Friday at the church. A celebration of her life will be 11:00 am Friday, February 8, 2019, at First Christian Church in Weiner with Pam Hogue officiating. Interment will follow at Waldenburg Cemetery under the direction Gregg- Langford Bookout Funeral Home. Honored to serve as pallbearers are Darrell Greeno, Paul Jones, Adam Tanner, John Greeno, Joe Brant Greeno and Forestt Greeno. In lieu of flowers, memorials may be sent to Weiner or Fisher Fire Departments. To send flowers or a remembrance gift to the family of Lillie Mae Greeno -GLBFH, please visit our Tribute Store. "Email Address" would like to share the life celebration of Lillie Mae Greeno -GLBFH. Click on the "link" to go to share a favorite memory or leave a condolence message for the family.